Shaw’s supermarket customers turned over store loyalty cards for coupons. Over the past week, shoppers at Shaw’s supermarkets across New England were greeted at the door and asked to hand in their orange store cards. In return, they were given coupons and a promise. “We want to offer every customer that walks through our door that same price, without having to worry about needing a card,” Shaw’s spokesman Steven Sylven said. The supermarket chain, recently acquired by a group of investors led by Cerberus Capital Management LP, is revamping its strategy and reinvesting in its 169 stores. However, by ending its loyalty card program, Shaw’s is making itself an exception in an industry that thrives on parsing, analyzing, and sometimes even selling the data these initiatives supply. “I don’t think they’re going away anytime soon,” said Elea Feit, executive director of the Wharton Customer Analytics Initiative at the University of Pennsylvania. Loyalty card programs began popping up more than 20 years ago and quickly became almost ubiquitous in supermarkets and drugstores. Today, Stop & Shop, Hannaford, and CVS are among the chains that use some version of these systems to track buying habits and encourage repeat visits by offering customers deals such as lower prices and discounted gas. To run a successful program, a company needs to think more about the data than the discounts, industry insiders said. Customer rewards will motivate shoppers to present their cards, but the real marketing power is in the information. Stores can use this consumer data to tailor offerings to their shoppers, provide customized deals, and manage inventory more efficiently over time. “If you’re not using the data, then why have the card?” asked Tony Gomes, vice president of marketing and corporate strategies for Springfield-based Big Y, which launched its store card in 1989. Today, the system is crucial to the chain’s marketing strategy, Gomes said. The information Big Y collects in its 61 stores helps it figure out what items their most loyal customers often buy and keep those products in stock, even if they are not particularly popular with the general population of shoppers. The company is also about to launch customized e-mail fliers, which will individually highlight deals on shoppers’ favorite items. “Without the card, we wouldn’t be able to do any of that,” said Gomes, who credits the card program with much of his company’s success. As technology and loyalty program research continue, loyalty program data collection is going to evolve, Feit said. The proliferation of smartphones is allowing companies to create apps that let customers keep grocery lists, receive coupons, and, of course, share this information with the supermarkets where they shop. Stop & Shop’s Scan It! Mobile app lets shoppers scan groceries with their phones as they shop to speed up the checkout process. Analysts are also looking for more ways to use these growing accumulations of data. Finding ways to cross-reference individuals’ grocery shopping patterns with their television viewing habits, for example, could give food companies powerful insight into which of their advertisements work best with which audiences, she said. Card programs make particular sense for midrange stores whose customers will be drawn to offer up their cards — and thus their information — in return for lower prices, said Feit. Stores like Trader Joe’s and Market Basket, which are known for having low prices, are more concerned with volume than personalization, and therefore may not be able to get as much out of a loyalty card, experts say. By terminating its loyalty card and lowering prices across the chain, Shaw’s is positioning itself in this group. It is also attempting, experts say, to repair the damage done to its reputation when it was owned by Supervalu Inc., when prices were high and stores were shabby. Even without card-based data about shoppers, Shaw’s will be able to use store-level data about product sales to tailor marketing decisions to different locations, said Sylven. “Tracking individual purchases is one way to do it, but it’s not the only way,” he said. 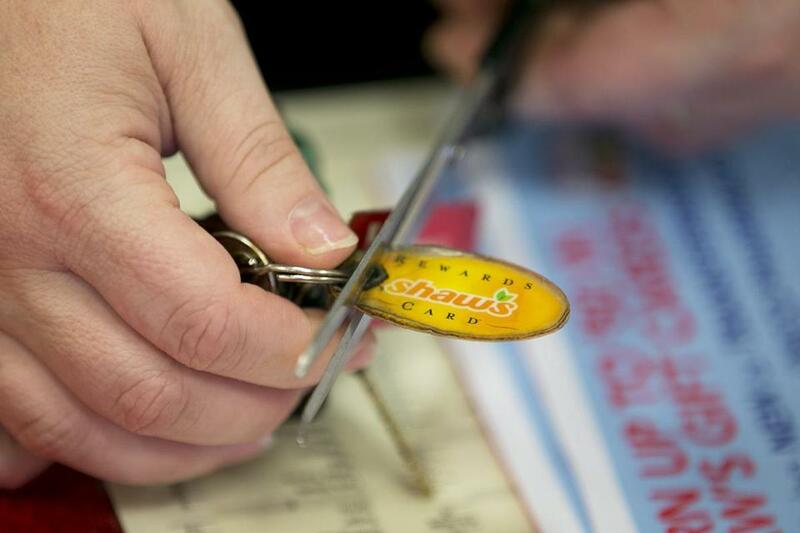 The news that Shaw’s has eliminated its store card “delighted” Katherine Albrecht of Nashua, N.H., a consumer advocate who has long protested the spread of store cards as an unwarranted intrusion into consumer privacy. She predicts that data about our food shopping might one day be used by the government or insurers to draw conclusions about our health. Sarah Shemkus can be reached at sarah.shemkus@gmail.com.